There are more than 20,000 species of Malacostracans described to date. Members of Malacostraca generally have a total of 19-20 segments; 5 segments make up the cephalon or head, 8 segments compose the thorax, and 6 or 7 segments make up the abdomen. It is difficult to generalize about Malacostracans because the group is so large and diverse. For example, some have a carapace and some do not. Malacostraca can be divided into two groups, the Phyllocarida, and the Eumalacostraca. Phyllocarida contains the oldest crustacean known and includes only one living group. They are also the only Malacostracans with phyllopodus (leaf-like) appendages. The Eumalacostraca consists of all Malacostracan groups other than the Phyllocarida. Eumalacostracans generally possess a well-developed carapace and a long, muscular abdomen. Eumalacostraca is the group that contains most of the animals the general public recognize as crustaceans, such as shrimp, crabs, lobsters. 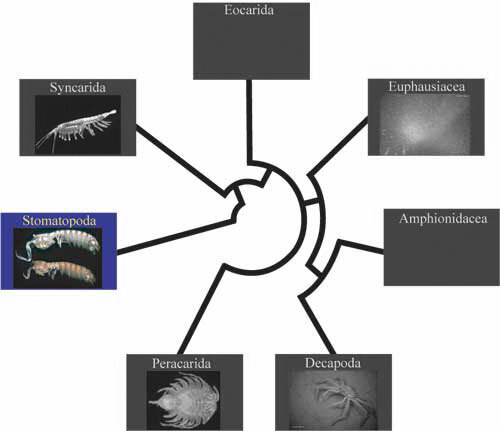 Choose from the cladogram below to begin exploring the Malacostraca.